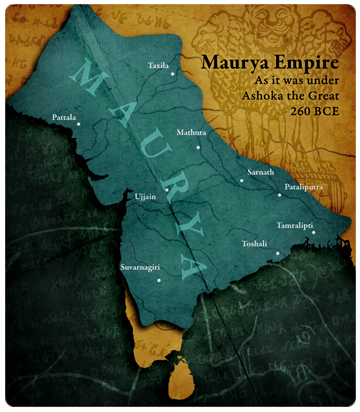 The spy system was an integral part of the Administration of Mauryan Empire. The goals of the secret service was to test the integrity of government officials, spy on cartels and population for conspiracy, to monitor hostile kingdoms, to destabilize enemy states, to get rid of troublesome powerful people who could not be challenged openly. Chanakya’s Arthashastra is considered one the finest political and war discourses ever written in prose form. Dating back to the 4th century, The Arthashastra is a huge work and has fifteen parts, each dealing with some aspects of the art of government. One of the most notorious features of the Arthashastra is its obsession with spying on the king’s subjects. A remarkable fea­ture of the Mauryan administration was the unin­hibited manner in which the organisation of a Secret Service was recommended and the use of Secret Agents for a variety of purposes. To keep a complete vigil over the entire administration, including the conduct of officers, a well-knit espionage system was evolved. A large number of detectives (gudhapurushas), secret agents, double agents, news agents, spies, counter-spies, etc. were posted all over the kingdom. Chanakya has given an elaborate description of the various aspects of espionage. He divides them into sansthan (stationary) and sanchari (wandering), each having several sub-divisions. Only the most efficient, smart and extremely honest males and females were recruited in this department. Cipher writing, code words, secret language, etc. were used and the services of courier pigeons were enlisted. The king was kept always informed of the working of the bureaucratic machinery. The spies were “the ears and eyes of the king”. The normal life of the people, though watched and reported upon, was not affected. The spies had to perform their duties very skilfully, carefully and secretly. There were spies against the spies and on impor­tant matters more than one agent was asked to collect information, which was then tallied and cross-referenced. The first category of spies was the fraudulent students or disciples. These students included those students who were involved in some kind of research, teaching or intellectual activity. These intellectual students were argumentative, brash and skilled enough to provoke others through arguments and in the process, understand any foul motive a person might nurture. The student spies also reported discontent growing in the minds of the youth and their attitude towards the kingdom and the ruler. Udásthitas or Ascetics were people who were highly intelligent with immense knowledge. The spies in this category were divided into units with each unit having a chief. The chief was provided with resources and lands so that the chief could carry out a number of activities of day-to-day life without inviting suspicion. The third type of spies was the poor farmers of the kingdom. These spies formed their own network of informers who could give them information from time to time. These informants were not only farmers, but also the land laborers and the landowners. The Vaidehakas were traders and merchants who were not very successful in their endeavors. The benefit of having Vaidehakas as spies was that they could easily use their travelling for information collection. Additionally, these traders and merchants also formed a nice network, making information collection an easy task. Vaidehakas could easily find out the discontent among fellow businessmen and pass on the information to the Mauryan ruler. The state-sponsored religious leaders were tasked with building ashrams in areas outside the urban areas. The ashrams were designed with political benefits in mind and spirituality was the secondary purpose. These ashrams were built only to attract the local populace, so that they could influence them and even try to diminish the respect of any local religious leaders they had. The working of these spies were very dangerous but in the interest of the state. They had a network of informers who would tell them, both the strength and weakness of citizens. These secrets was then used for fortune-telling via palmistry. The religious leader would then predict calamity, accidents, mysterious deaths (obviously assassinations planned by the state themselves). He would even predict government awards and honors to specific person, which obviously were discussed between him, King and the ministers beforehand. All these five types of spies were paid for their work in cash and comforts. However, the appointment was done mainly on the basis of their pure character and foresightedness. To undermine a ruling oligarchy, make chiefs of the [enemy’s] ruling council infatuated with women possessed of great beauty and youth. When passion is roused in them, they should start quarrels by creating belief (about their love) in one and by going to another.